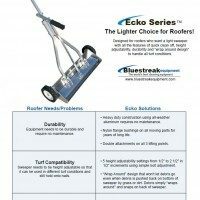 The Lighter Choice for Roofers! Designed for roofers that want a lighter sweeper but with all the features of quick clean off, height adjustability and durability. Designed for use on grass because of its unique “Wrap Around” feature that prevents debris from being wiped off by long grass or weeds. The debris simply snaps around onto the back of the sweeper. Secondary debris release handle, simply pull and debris falls off. Five wheel height adjustment settings to fine tune the sweeping height for optimum performance. 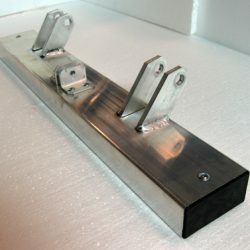 Debris release handle lifts magnetic housing out of the tray. Debris then drops off the bottom of sweeper. "This is something that when you go around after a job you can be assure it's going to go ahead and pick everything up for you. These things are nice. I'm done with the cheap stuff. I wanted something that's quality. I did a lot of research and looked around and this is the company that I found." On a tool there should be nothing extraneous that doesn’t have a purpose, everything should be for a reason, and form should follow function. The Ecko like all Bluestreak magnetic sweepers exemplifies this. The five wheel height settings allow you to fine tune the sweeping height to ensure maximum performance in your conditions you normally experience. 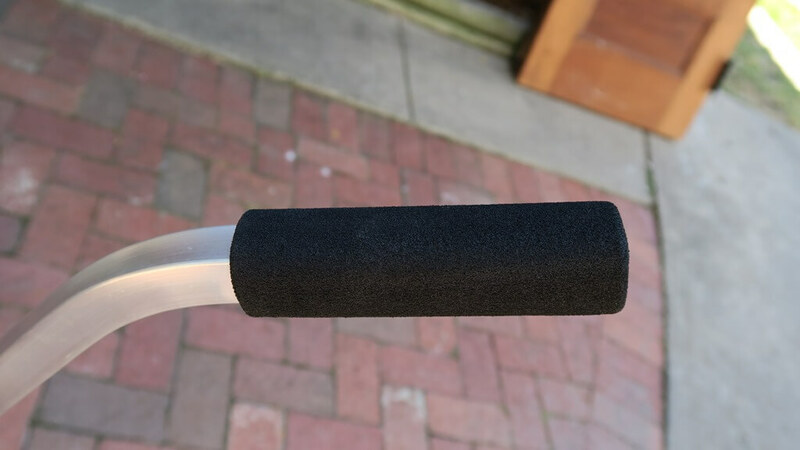 The angled front nose makes it much easier to push through the grass, all the pivot points have nylon flange bushings so there is no metal on metal contact, meaning no squeaks, long life, and a nice tight feel to the tool. And the feature you’ll use the most, the handle, was specifically made three pieces to give the handle sturdiness and durability and also contributes to the tight feel of the sweeper unlike many single piece handle designs on the market. It’s all about the details and the Ecko pays attention to them all. The strength of the magnet and pickup is awesome.
" Once I received the Ecko, I went back over the areas that were already done and I picked up a ton of nails left behind by my bargain sweeper. Right there sold me on this sweeper. While I love the design and wrap around, the strength of the magnet and pick up is awesome." 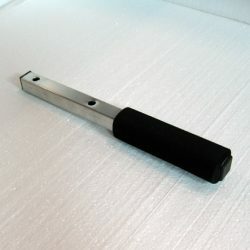 Adjustable sweeping height from .5″ to 2.5″ to accommodate any situation. Height adjustment allows fine tuning of performance on a variety of terrains and conditions for optimum performance. The feature you’ll use the most, the handle, was specifically made three pieces to give the handle sturdiness and durability and also contributes to the tight feel of the sweeper unlike many single piece handle designs on the market. A performance test to show the pickup height of the Ecko magnetic sweeper. We’re using a 2 1/2 inch nail for the test and the Ecko is picking it up at a 3 and 1/2 inches height. Available in two sizes 20" and 26". 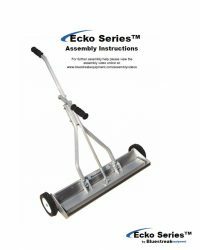 I just wanted to share my comments about my Ecko 20 magnetic sweeper I received last week. I had my roof replaced yesterday and while the contractor ‘swept’ the area in my yard with his magnet, I went out last night and swept the area with the Ecko two times at different height settings. The results were amazing!! I filled up a one quart can with nails!! This was an awesome purchase…I will use it after all projects in the future!! I give it 5 stars (or more)!! A Quality Tool that is Easy to use and Reliable. 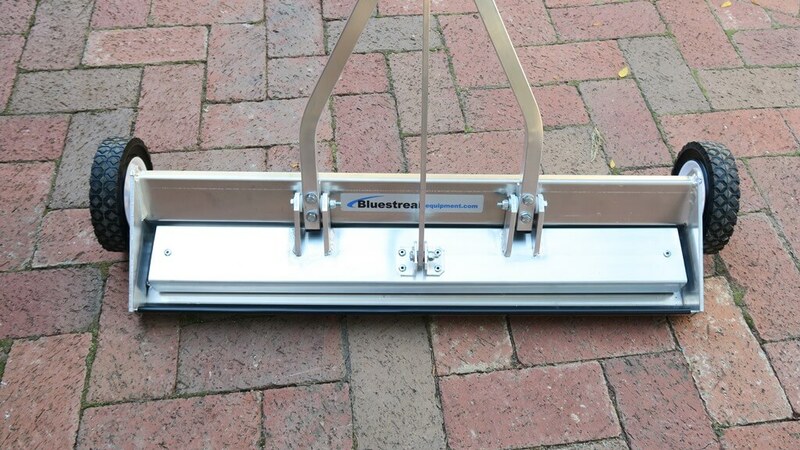 The Bluestreak Equipment Rolling Magnetic Sweeper is a quality tool that is easy to use and reliable. The wrap around design means you won't leave any metal behind. A great design for the professionals. 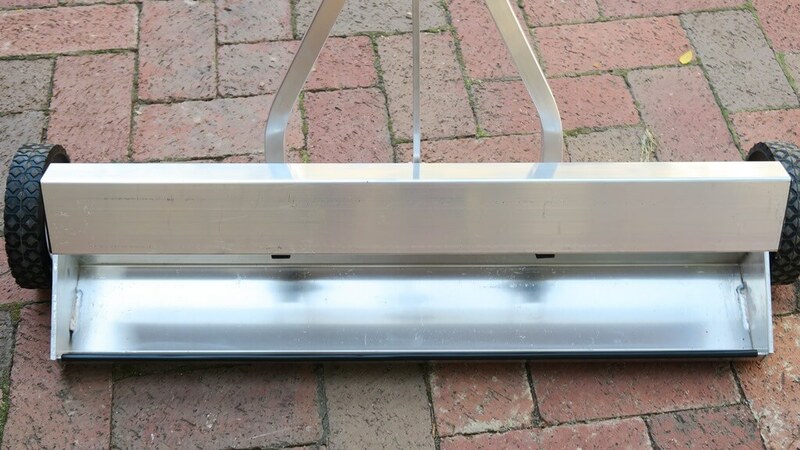 A magnetic sweeper is one of those tools that you really don’t think about. Most guys are quick to brag about their drill, saw or impact, but not so much when it comes to a sweeper. It’s one of those tools that doesn’t get the respect it should. I understand why it doesn’t get the respect, there’s no motor, no power. But it should get respect because of what it does. A sweeper cleans up after you are done and can save your name and your money. 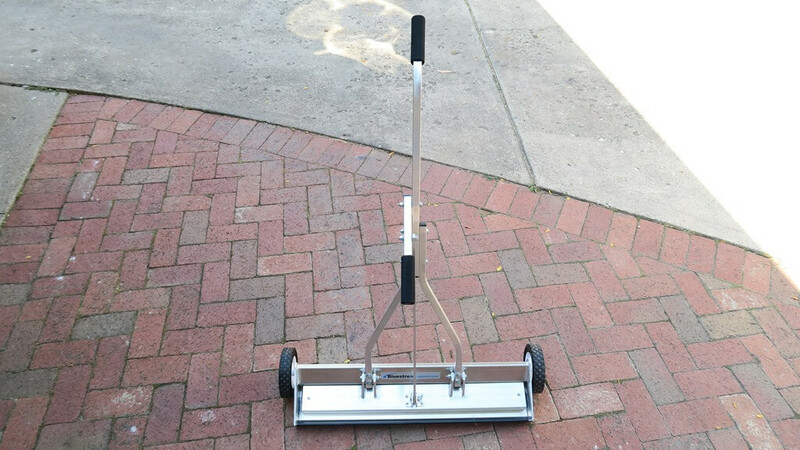 So let’s jump into the rolling magnetic sweeper review. 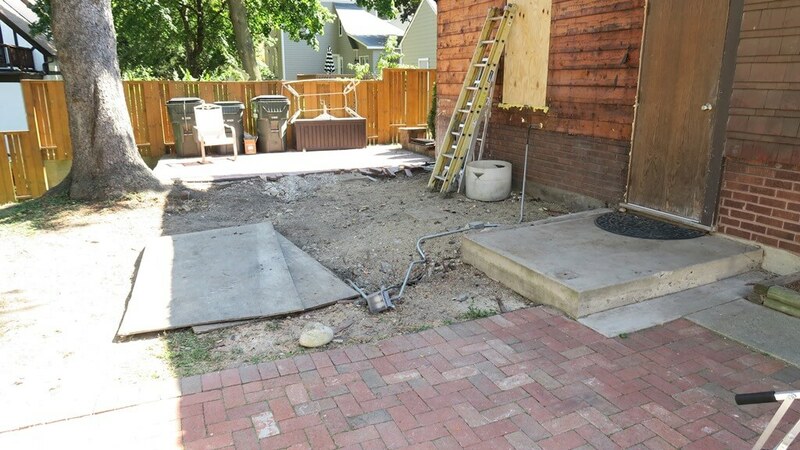 I am doing a bunch of work around my house and we removed a room in the back. Needless to say that when we were done, there were nails and other metal objects everywhere. I grabbed my roller and went to town. About half done, the roller broke. Inspecting it closer I realized how cheap it was made. So I set out to find a quality replacement. I kept coming across a company called BlueStreak Equipment so I reached out to them and learned a little more about their company. After performing my due diligence I was sold on them. The company seemed like it really cared about the quality of their product and their customer’s experience with their product. Take a look at their company, it’s amazing how many different sweepers and magnetic products they offer. They do anything from a simple magnetic roller all the way up to airport stuff. What I really liked about BlueStreak is they don’t make a one size fits all sweeper. They offer a wide variety for specific applications. Long story short, I ended up with the 26″ Ecko Series and love it. Before I go into the features, it’s easy to see the difference between this quality sweeper and the cheap ones. 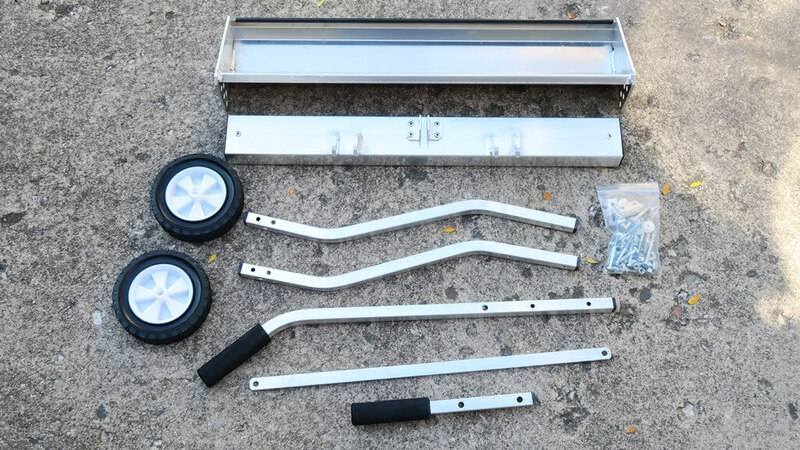 The sweeper is shipped in a single box and does require assembly. Good news, the directions are great and it’s very easy to put together. The sweeper is mostly a strong aluminum frame. 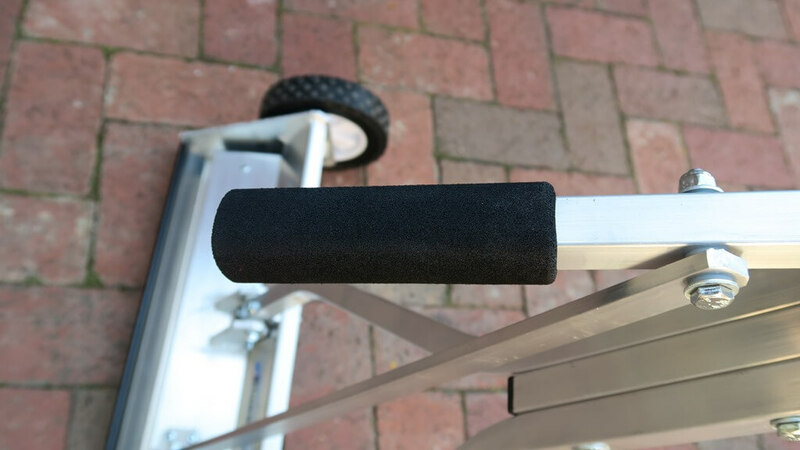 The push handle and the release handles have a soft sponge padding for comfort. 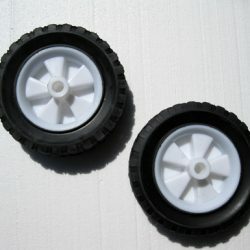 You can adjust the wheels to 5 different heights. You will need a wrench to make this adjustment. I do wish they had a single level that would raise and lover the unit instead of having to loosen a nut to make the adjustment. 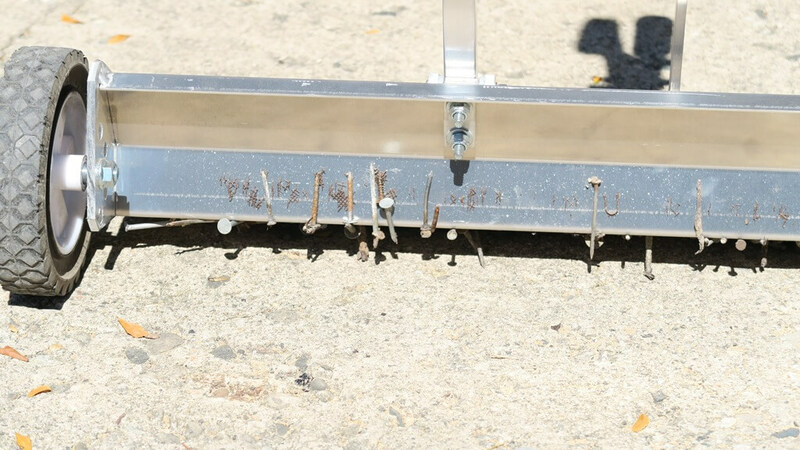 After you are done sweeping an area, just lift up the release lever and the magnet will raise which will let all the metal objects fall to the ground in a pile. The wrap around design is the bread and butter of this system. As with all sweepers, the magnet will pull metal objects to the bottom of the sweeper. However, the Ecko has a unique wrap-around design. 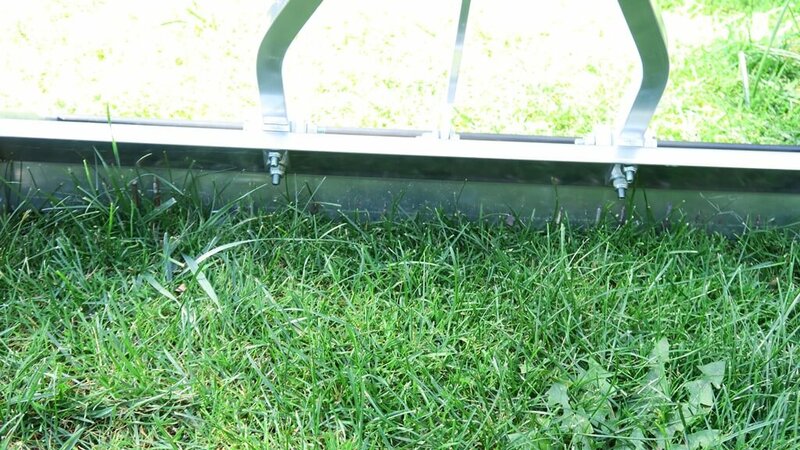 When you are going through grass, the grass can eventually push the metal object to the back of the sweeper where they fall back into the grass. 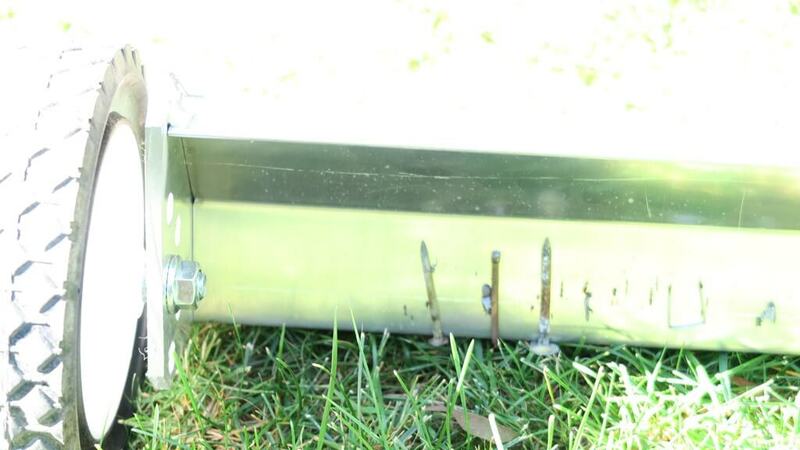 With the Ecko, instead of falling back into the grass, the magnet will pull them up around the back so they never fall back down. Awesome design feature. As I noted earlier, my sweeper broke about halfway through my clean up. Once I received the Ecko, I went back over the areas that were already done and I picked up a ton of nails left behind by my bargain sweeper. Right there sold me on this sweeper. While I love the design and wrap around, the strength of the magnet and pick up is awesome. This was the area we removed the room. As you can see the terrain is very uneven. This is what I picked up even after sweeping the area with my old sweeper. 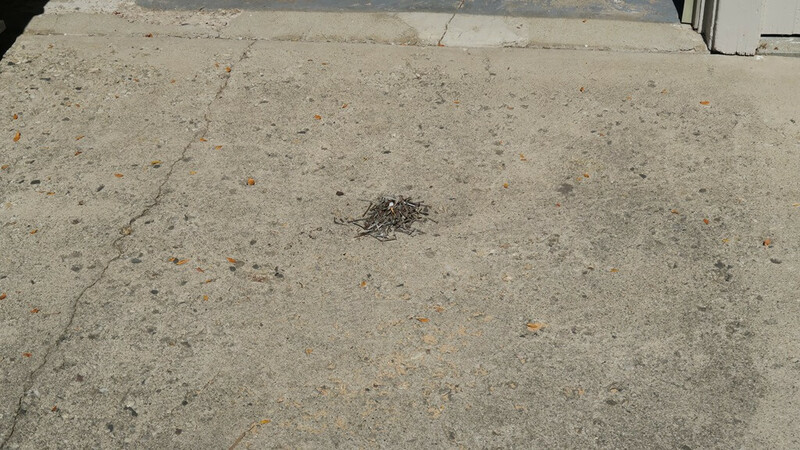 This was all the nails I picked up on the side that was never swept. 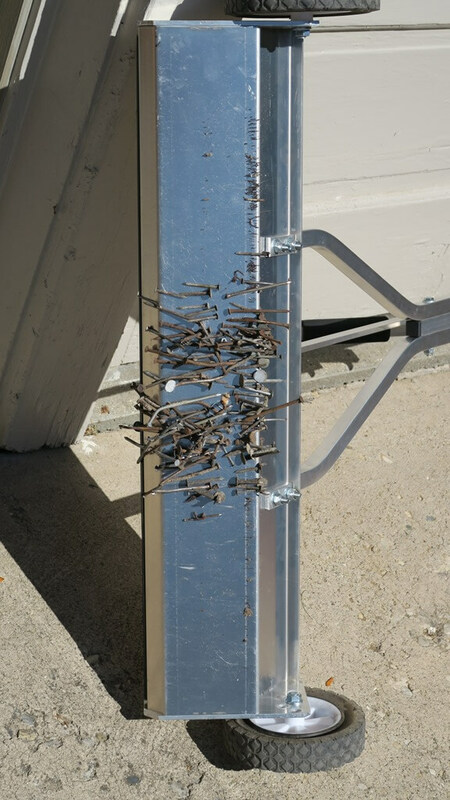 Notice that the nails are sticking everywhere and not just in certain areas. That is because this sweeper uses a full magnet and not a couple magnets put together. I decided to go through the tall grass since I replaced windows a couple of weeks earlier. 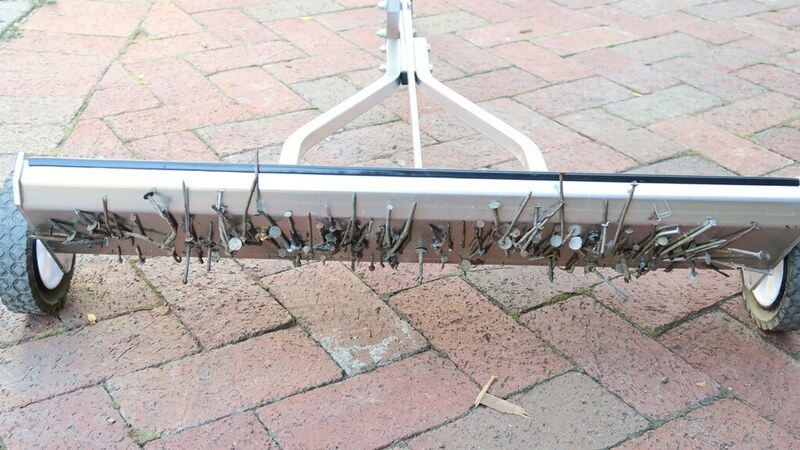 Even though I went through with my old sweeper, I still picked up a bunch of nails. You can really see how the wrap around design keeps the nails on the sweeper. 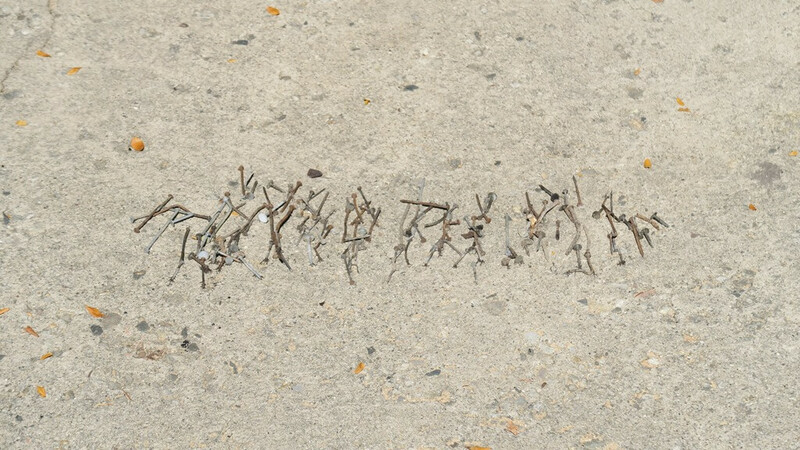 Any other sweeper would have dropped these nails back into the grass, but not the Ecko with the wrap-around design. All in all this sweeper picked up a bunch of nails, screws and other metal objects. After using this sweeper, I am fully impressed and am sold on the wrap-around design along with the full magnetic system. 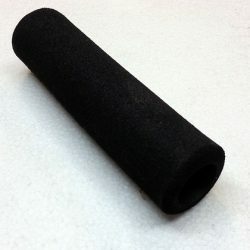 This roller retails for about $200 which is worth every penny. BlueStreak also offers less expensive models, but I love the Ecko series. When it comes to sweepers, sure you can buy other brands but let me tell you that after my research I can really tell a difference between the cheap rollers and the quality rollers like the Ecko. If you are in the trades I would pony up the extra couple of dollars and give yourself peace of mind that you are cleaning up everything once the job is done. 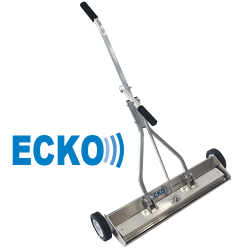 Using the Ecko makes it easy to clean up once your job is done or once you are done for the night. 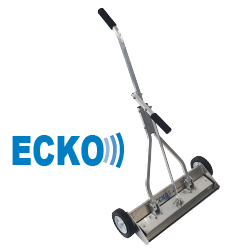 BlueStreak made a high-quality product with their Ecko series sweeper. I love how light the tool is and how easy it is to use. The biggest plus with this sweeper is the wrap-around design which works awesome. You can be assured that once you pick up a piece of metal, it will stay attached until you want it removed. Grass and other objects will not knock it off.